The main road dividing Minar-e-Pakistan (Iqbal Park ground) and Lahore Fort was closed for normal traffic during the construction of Azadi Interchange. This road links Azadi Chowk to Lorry Adda. During construction of the Azadi Interchange, heavy vehicles and machinery used this road to bring sand, mud, iron, bricks, concrete, etc, due to which it had broken. During that time, the parking of Lahore Fort, which was situated in Atiq Stadium was shifted to Azadi Chowk.Presently, though the Azadi Interchange was completed, the road linking Azadi Chowk to Lorry Adda is still in a deteriorated condition and no vehicle can travel on it. Two makeshift parking stands, one at Azadi Chowk and the other near Darbar Baba Haider Sain (near Lorry Adda) are operative where visitors can park their vehicles and then have to walk for at least 20 minutes on the dilapidated road to reach the Lahore Fort. Roshinai Gate, another gate from where people can enter the fort from Food Street, Fort Road side was also closed to all kind of traffic. Even people on foot cannot enter through this gate while the third option to enter the fort is a gate towards Rim Market. It was also closed to all kinds of vehicular entries and only a small window is open to pedestrian entries. Shakeel, a student of Bhalwal, said he had come to visit the fort with his schoolmates and was astonished to see that the road leading to this world heritage was no more available for traffic. “We walked almost 45 minutes to reach Deewan-e-Aam,” he said, adding that the three-hour tour was shortened to an hour due to this walk. Javed, a senior tourist guide, said the number of visitors had reduced significantly. During winter, around 5,000 to 6,000 people visited the fort on daily basis and these days, the ratio had been reduced to 1,000 to 2,000 visitors per day. “Visitors with families, old people and disabled are facing serious problems in reaching the fort due to a 20 minutes’ walk,” he claimed. He appealed to the government to take immediate notice of the situation and take appropriate action. 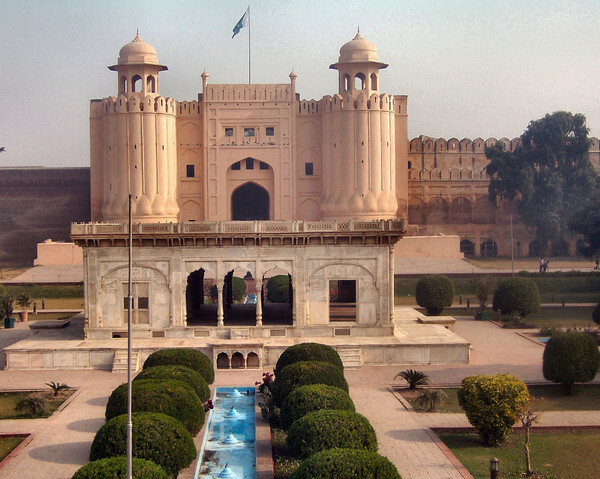 Kamran Lashari, Director General Walled City Lahore Authority (WCLA) said this was a world heritage site and the authority was planning to provide best tourist facilities there. He said the maintenance and upkeep of this place was important as it represented the heritage and history of our country. Asif Zaheer, Director Marketing WCLA said the fort was recently handed over to the authority and they were requesting the departments concerned to help them in maintaining the world heritage site and make it presentable before the tourists. This entry was posted in Architecture, Fort, heritage, Lahore, Walled City and tagged heritage, Lahore, Lahore Fort, Lahore Heritage, Mughal Architecture, Mughal Emperor, Mughal Era. Bookmark the permalink. Why am I not surprised at the facts presented in this article? Afterall we live in the “Islamic Republic of Pakistan” a fortress of Islam. How can the authorities who happen to be Muslim provide any sort of concession and comfort to the masses and in this case visitors to the Lahore Fort. One fact that one can not overlook is that the Azadi chowk flyover and the related works are a major source of kickbacks for the concerned authorities. What kind of under the table financial benefits would a deteriorating old fort provide the same individuals? So why take measures to facilitate visitors. Other normal and progressive countries (so called “kaafir” mumalik) go the extra mile to promote sites that are a national heritage but not in the “Islamic Republic of Pakistan”. One can only hope that someone would take a notice of this and alleviate the trouble faced by visitors and others outlined in this article. Perhaps Imran Khan’s “Naya Pakistan” might be the answer if that ever becomes a reality. Lahore fort plus all other amazing historical buildings should be looked after or there will be nothing remaining in a few years time, This is a 400 year old site but very sad to see people’s pan spit and graffiti saying such as falana was here. Why destroy your own heritage by writing or scratching the walls?